Offering you a complete choice of products which include leather hipster wallets, men's leather hipster wallets and mens hipster wallets. Description :This larger sized ID hipster leather wallet allows your credit cards to spread out and lie flat in your pocket, fine leather with a smooth hand feel enhances the beauty by its rich color. leather made in italy 7 credit card slots 1 clear ID/photo window 2 receipt slots 2 interior pockets “columbus” woven fabric lining inside complimented with reverse debossed “C” logo on the top. Description :This larger sized hipster leather wallet allows your credit cards to spread out and lie flat in your pocket, fine leather with a supple hand feel enhances the beauty by its rich color. 8 credit card slots 2 bill compartments 2 interior pockets “columbus” woven fabric lining inside complimented with reverse debossed “C” logo on the top. Description :Designer leather hipster wallets with dual colored leather. 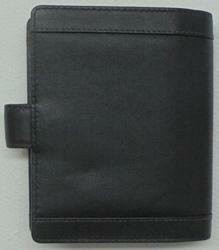 Features 6 credit card slots and a bill compartment. Looking for Leather Hipster Wallets ?